Transitioning to a big boy or big girl bed is an exciting milestone in a toddler’s life. But let’s face it, parents aren’t exactly ready to roll with potential falls – or rails that look more at home on hospital beds. Enter Munchkin's Sleep™ Bed Rail, which combines the utmost in safety with fun, modern style. This innovative child safety rail features a durable aluminum frame and adds a pop of color to your child’s bedroom décor. Available in grey, lime green, aqua blue, or pink, this mesh toddler bed rail is 18” tall and extends to 36” wide. The safety straps eliminate gaps between the bed rail and mattress, providing excellent security, and a push-button folding hinge allows kids to climb in and out of bed easily. The Sleep™ Bed Rail fits twin, full, and queen-sized mattresses. 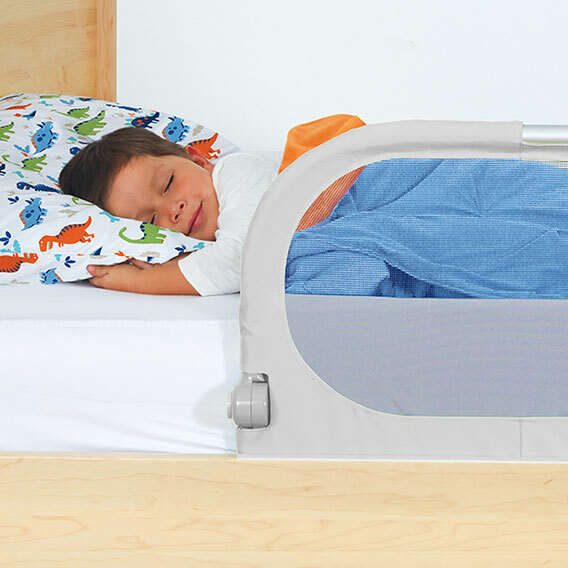 When safety and style meet, they open the door to worry-free sleep (for kids and parents alike).